WASHINGTON -- As the presidential campaign enters its final weekend, the polling snapshot remains essentially unchanged. President Barack Obama and Republican presidential nominee Mitt Romney remain essentially deadlocked in most national surveys, but polls in battleground states continue to show Obama with just enough of an edge in states whose electoral votes would add up to more than the 270 needed to win. With just four days remaining until the vote is counted, poll watchers should be on alert for any developing trends that might signal a late shift in voter preferences. As of this writing, there are a few hints, but none that rise to the level of statistical significance. The margin separating Obama and Romney in the national polls clearly narrowed following the first presidential debate on Oct. 3. Since the middle of October, however, the HuffPost Pollster poll tracking model, based on all available public polls, has shown a roughly even race for the national popular vote. Over the past week, the national estimate has tipped to Romney by about a half a percentage point, randomly varying up or down within a range of roughly +/- 0.3 points with each successive update of the model. As of this writing, however, Romney's edge is at the low end of that range. The larger point: the current razor-thin margin is just one-tenth of 1 percentage point different, as of this writing, from what the model estimated on Oct. 16, the day of the second debate. 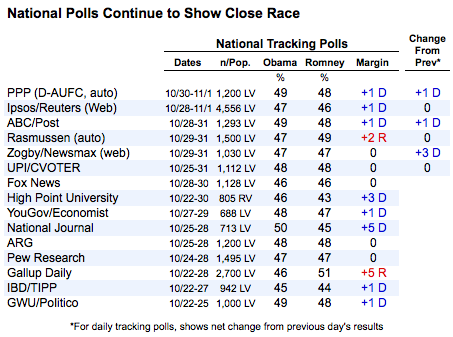 For the moment, at least, nearly all of the recent national poll releases are showing either a tie or a slight Obama edge. Only two polls -- the Rasmussen automated tracking poll and the last update of the Gallup Daily tracking released before Hurricane Sandy made landfall -- give the edge to Romney. Of course, given the close nature of the race and the margins of sampling error associated with each poll, none of the individual surveys can identify the true leader in the national popular vote with statistical confidence. The national popular vote estimate produced by the Pollster tracking model takes pollster "house effects" into account, which means it works to bring the results of individual pollsters into line with industry averages. Thus the presence or absence of polls that consistently lean to Romney (such as the Gallup Daily and Rasmussen tracking) or to Obama (such as the Zogby Internet poll) will not alter the daily estimates, as they might with a simpler average. We have also entered more than two dozen new polls into the Pollster database over the last 24 hours, most from the key battleground states, but the estimates of the polling snapshot distilled from these surveys looks about the same as it has for the past three weeks. Obama continues to maintain leads of 2 to 4 percentage points in four states -- Ohio, Iowa, Nevada and Wisconsin -- that when combined with other states where he leads by larger margins, add up to 277 electoral votes, just over the 270 needed to win. Four more states representing a total of 55 electoral votes -- Colorado, New Hampshire, Virginia and Florida -- currently show margins of less than 2 percentage points separating the candidates, with all but Florida currently tipping slightly in Obama's favor. To win the election, Romney would need to sweep all four of these states plus either Ohio or both Nevada and Iowa. Over the past two weeks, the model's estimates have remained reasonably stable, with Obama doing slightly better in most states, as of this writing, compared to what our estimates were showing on Oct. 16 -- but with Romney having gained slightly in two of the most important states, Iowa and Ohio. 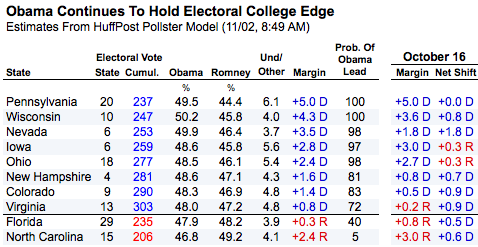 Obama's Iowa and Ohio margins remain relatively small, though given the high volume of polls in the past few weeks, the model reports very high statistical confidence that Obama would lead if polls are accurate and all votes were cast today. That statistical confidence does not allow, however, for the possibility that polls might be collectively wrong by enough to reverse these margins, which past history says is a small but real possibility. The coming weekend will feature the final releases from a long list of prominent pollsters, which will give us our last indication of late trends, should any appear. For the moment, however, the polling snapshot remains mostly the same.